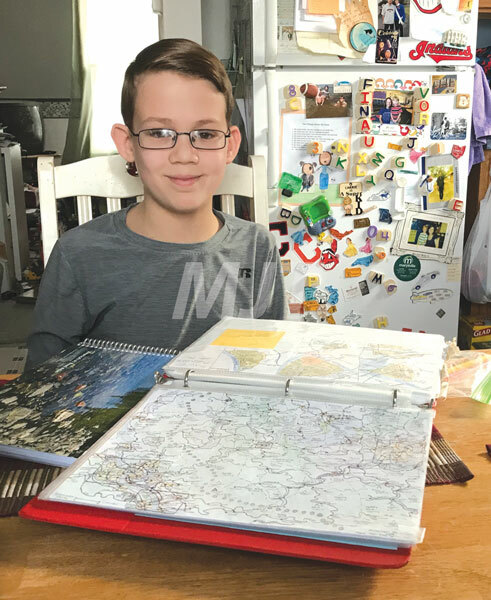 Xavier Bezusko, 13, of Marysville, shows off his binder of maps he’s drawn, both real and imagined. Xavier recently won Bunsold Middle School’s geography bee. Xavier Bezusko, 13, of Marysville, has a collection of maps he’s drawn. One recent map is rich with detail. Roadways spider web from densely populated towns, getting sparser as they extend into more rural areas and eventually to the detailed country borders. There’s a small line in the bottom left corner, showing that one inch equals 20 miles. Perhaps the most remarkable part of the map, however, is that the area it depicts isn’t actually real. Xavier came up with it in his head, and then drew it. Xavier, son of Dave and Carrie Bezusko, is a Bunsold Middle School student who last week beat hundreds of other children to win the school’s geography bee. Xavier said the first round consisted of a paper all students completed in social studies classes. Those who did well took another test. Those who got to the finals were given a white board and asked to answer questions from judges. Now, Xavier is poised to move onto the state level of the geography bee and show his passion to a wider audience. Xavier is able to name all state capitals, and knows that the longest interstate in the U.S. is interstate 90, which runs from Boston to Seattle. “He looks forward to the debut of the new Rand McNally (maps) like some guys do the (Sports Illustrated) swimsuit issue,” Dave joked. After a recent contest within the family, Xavier also recently proved he knows all 88 county seats in Ohio. “I thought I did alright with 80, but I couldn’t match him,” Dave joked. Xavier’s love of geography extends to places that don’t even exist. One of his pastimes is drawing up maps of fictional areas he comes up with. “If some author wanted to do some world building, and wanted a really good picture of a map, he would be the person to go to,” Carrie said. Xavier said he doesn’t always finish maps, if they’re not turning out how he’d hoped. Often he will tell his parents about the various towns, asking them where they’d want to live. “He’ll draw international and municipal airports,” Carrie said. The metropolitan areas vary in size, and they’re colored with various populations. Carrie joked that you can tell what kind of mood Xavier’s in when he’s naming his towns. “Sometimes it’s like, ‘Poopville,’” she said. Xavier said he always tries to vary his maps, so each one is different. One map he made featured a volcano. “I just dropped a marble, and wherever it landed, there was a huge volcano,” Xavier said. Whether it’s drawing maps, or building towns out of LEGO, Xavier is there. Carrie said his love of maps and building could stem from his appreciation of numbers. According to Xavier, his favorite subject in school is math. His parents said the earliest indication of his love of maps was during trips in the car. Much of that early fascination centered on roads and signs. His earliest maps, according to Carrie, were interstates of Ohio. “He would mention every road sign you would see, every speed limit sign,” Carrie said. She recounted one instance of Xavier going to the zoo on a field trip. The driver decided to take a certain route. “Xavier kept saying, ‘This isn’t how you’re supposed to get there,’” Carrie said. That fascination has persisted as Xavier’s gotten older. The recent opening of Cook’s Pointe Boulevard was a bit of an event for him. “The first day it opened, one our way to school, that’s how we went to school even though it was out of the way,” Dave said. While she joked that it can occasionally get a bit annoying, Carrie said Xavier is usually a genuine help during road trips. “He’s great to have in the car because he always knows where you’re going,” Carrie said. Dave joked that while some people have a GPS, his family has an XPS. Xavier said once he’s been somewhere, he knows how to there in the future. Xavier’s heightened sense of where he’s visited, and how to get there, also started early. Dave said when Xavier was about five years old, the family went to visit Dave’s sister in Williamsburg, Virginia. “He could tell you how to get to her house, door-to-door,” Dave said. Dave said parents are always worried about what their children will grow up to be. Xavier said he wants to be a New York City traffic cop, but his parents wouldn’t be surprised if he took on a broader role. “I would not be surprised to see him in some sort of city planning,” Dave said.